Recently I solved an electrical problem that got me thinking about 3 terminal networks, so I thought it would be a great opportunity to explaining how to measure and convert between the different topologies. I got a panicked call from my parents recently after they'd lost power and were unable to turn it back on. I did the basic things before getting there, like checking the website of the power company for any outages, then checking twitter for any car accidents in the local area that could have cut power by damaging a power pole, but I drew a blank. On a arrival the problem became clearer, they could turn the power back on, but five minutes later the residual current device (RCD) would cut out. This indicates that an appliance had a fault, but not so serious that it would immediately trip the breaker. To isolate the problem, all the individual circuits were turned off, then turned back on one at a time, waiting 5 minutes between each one. The next step was to find the appliance on this circuit, the same process was followed, all the power points were turned off, and then gradually turned back on until the problem was found. It turned out to be my mothers laptop power supply. I assumed that something like a capacitor in the input filtering circuit had failed, or the transformer had failed somehow, either way I'd accepted that the supply was dead. I thought it'd be interesting though to find out how damaged it was. To test this, I set up a test power point with it's own lead, but didn't connect the Earth. On the back of the power point I connected a multimeter between the Earth and Neutral terminals. This allowed leakage current to flow through the ammeter to neutral, without causing the main RCD to trip. This was all powered by an extension lead that I could turn on and off from a safe distance. (I HATE mains voltage) Also make sure that there are no children or pets around that can distract you or get injured. The power point was dissembled and made safe immediately after the test, leaving dangerous things that look safe laying around is asking for trouble. I started the test and measured a small leakage current of 6 mA, but also heard a small crackling sound. I shut everything down and did an inspection of the power supply. The C5 type input plug was noticeably hot. At first it kind of made sense that the hot spot was near the entrance to the power supply, that's where all the mains components should be, but the plug was way hotter than the power supply. On closer inspection I noticed what looked like melted plastic on the plug itself. It could be left over from manufacturing, but the other side looked fine. With the plug removed, I measured the resistance between all three prongs on the mains plug and got results in the range of 30 to 70 kilo-ohms. When the lead was tested by itself with mains power and no load, the lead still got hot. That shouldn't be. To wrap things up I replaced the lead with an old one and have had it plugged in for about 5 hours now with no problems. I don't know how the fault occurred, it seems strange to have resistance between all three pins. It seems like something that a liquid spill could cause. Other than that, I don't know. After writing that last sentence I went and checked the resistance on the outside of the plug, I picked two random points and got around a mega ohm. The outside shouldn't be conductive at all, so I'm almost certain that something was spilled on it, even if it wasn't noticed when it happened. All the talk of resistance between 3 terminals got me thinking about delta and y topologies. 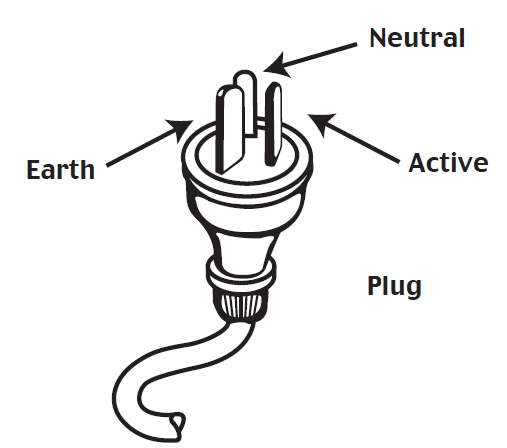 In the diagram below you can see the C1332 style Australian mains power plug. The discussion above describes measuring the resistance between all three pins, but how would you represent that in a circuit if you wanted to model it? 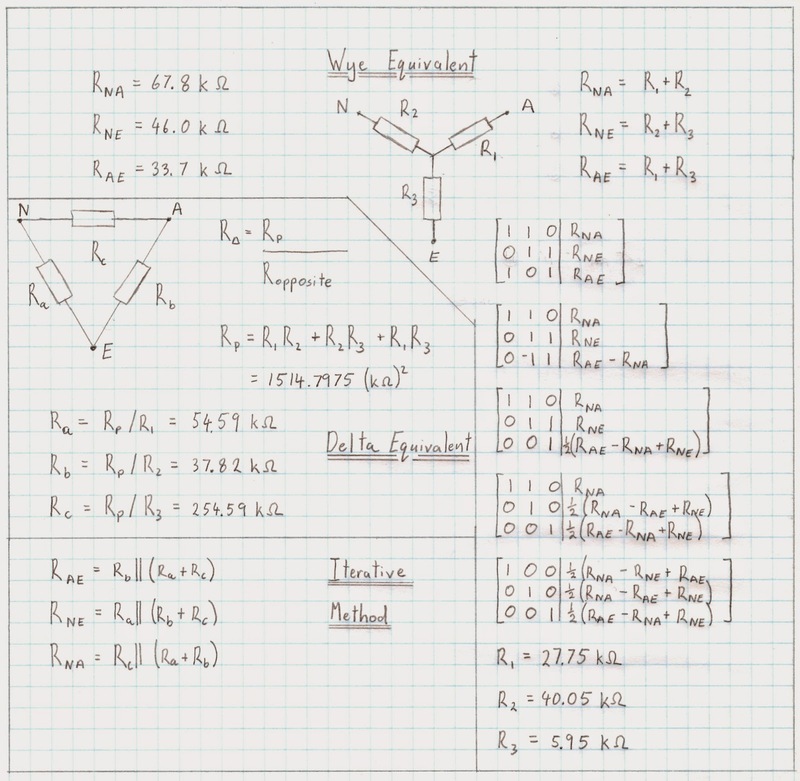 You can't simply place resistors equal to your measurements between the pins in a triangle arrangement. Measuring between Earth and Neutral would then give you that resistance in parallel with the sum of the resistance between Earth and Active, and Neutral and Active. So we need to do some maths. Yayyyyyy!!!! I find it easiest to start with what's called the Y or wye configuration. It's called that because you place three resistors in a Y shape, as seen below. You have a similar problem though. Measuring between any two terminals gives you the sum of two resistors, for example measuring between Active and Neutral gives the sum of the resistances R1 and R2. It's trivial to write three equations to describe this arrangement and then solve the simultaneous equations. I've done it via the reduced row echelon method. You can now use the values of R1, R2, and R3 to model the circuit. You can also model the circuit using a delta arrangement, which is three resistors in a triangle between the terminals. Converting between the Wye and Delta topologies is easy enough and is a well known conversion. After performing the conversion you can use the resistors Ra, Rb, and Rc in a delta (triangle) arrangement to replicate the circuit. Another technique not as well known uses an iterative method to go straight from measurements to the delta resistor values. You write out three equations that describe your circuit and the values you want to find, make estimates for all three values, in this case 50 kilo-ohms was a good starting point. You then use one equation and two variables to calculate a new guess for the third variable. Do this for each variable and repeat until the resistor values converge. I've used a different naming convention in the example below (my bad), but you can see the process in action. The first equation uses guesses for Ry and Rz to calculate a new value for Rx, the second equation uses Rx and Rz to calculate a new value for Ry, and the third equation uses guesses for Rx and Ry to calculate a new value for Rz. This is repeated until the values converge. This is a numerical approach that sometimes works, it depends on how well behaved the equations are and if they converge. For example if you were to use this method to get from the initial measurements to the Y configuration it would fail and the resistor values wouldn't converge, they'd just oscillate. Typically you need a division by one of the variables in the equations for it to work. I'm sure there's a formal mathematical definition for when it will and won't work, but I'll leave that for someone with more time, sleep, and mathematical ability. The above spreadsheet can be found here.